There is a saying among westerners stationed in Japan that if you don't climb Mt. Fuji while you are there you will end up stationed there again. Fuji climbing mishap stories abound as well. It is a lot like birth horror stories. When you are pregnant everyone seems to delight in telling you about how bad things went for them (or their cousin's cousin twice removed). 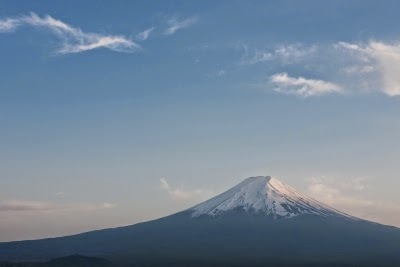 As soon as people hear you are planning to climb Fuji, the stories will come out. Here's our story, or as I like to think of it, a tutorial in all the things NOT to do when planning to or actually climbing Fujisan. I'm going to split it into parts and call it my "Top 10* Things Not to Do When Climbing Fuji"
Very early on in our time in Japan we (that is the Professor and I) decided we wanted to climb Fuji. But we wanted to do it with the kids so we decided to wait for them to get a bit bigger so they would be able to make the climb. Our last summer in Japan was approaching and it was a very full one. The window for climbing Fuji is small. You can only go in July and August. It was hard to see how we would fit this in. Then the boy scouts announced a family trip to Fuji and it just happened to be at the only possible time for us to make the climb. How could we pass this up? The first week of July I was crazy busy preparing for the major event of my job, running a Vacation Bible School with over 250 kids and 100 volunteers. The second week of July**, we went on a family vacation to Guam. Great fun and very relaxing. The third week of July was non stop motion preparing for VBS and asking myself what I was thinking taking a vacation the week before. Then the crazy week of VBS itself. All 5 of us were heavily involved including the Professor who helped out each day and then went to work and put in another full day. Sunday morning we went to the 8:00 am service and then drove the 12 hours down to Camp Fuji to meet up with the boy scouts. Monday morning at 5 am we headed out to the mountain. Tuesday afternoon the Professor took the train back home and the kids and I drove in to Tokyo so we could meet up with my brother and his family who were flying in for a visit. So, tight schedule like I said. 'Cause when you're planning to climb a 3776 meters mountain it obviously makes sense to start out already exhausted right? *Or however many things I end up coming up with. Obsessive pre-planning is obviously not my problem or I wouldn't have this story to tell. I think I've heard this one before....oh,dear. Just said again today how much we miss you guys and how scarily alike we are.